This run explores the breathtaking UNESCO World Heritage Site of Siena, known for its cuisine, medieval cityscape, and twice-annual Palio horse races. The narrow brick streets of Siena are ideal for running and sightseeing — around each corner, wonderful views and architectural gems await. 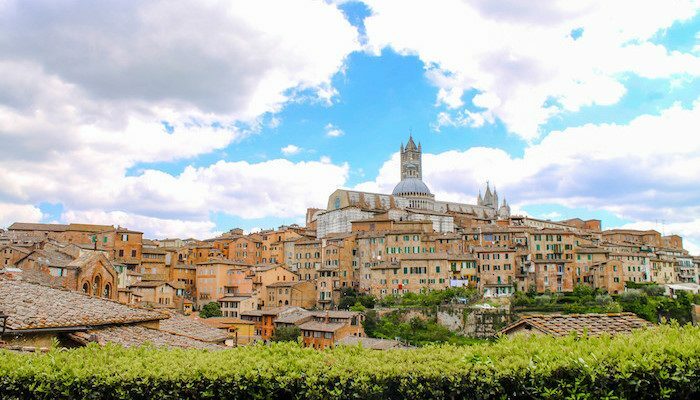 Siena is nestled at the intersection of three hills, so this route is somewhat hilly, but the climbs are generally short and suited to runners of all abilities. The route starts out in the center of the city, passing the Santa Catarina Church, Olla Federica, and the Palazzo del Magnifico. From here, it bends south towards Porta San Marco, around the botanical gardens, and west towards a couple musuems. After this, it loops back through the city center, by the University and the Metropolitan Opera, before returning to the start via the beautiful public gardens. Thanks to Go! Running Tours Florence for their help planning this run. This route is available as one of their running tours in Tuscany. Dive into the ancient culture and history of Siena while running with an expert guide and architect!